One of our longtime readers, Christine Majule, sent in this guest post after getting to see the Pal Tiya dragon in person. Pal Tiya, by the way, is a new new waterproof sculpting material that was invented by Kim and Woz Beaton. 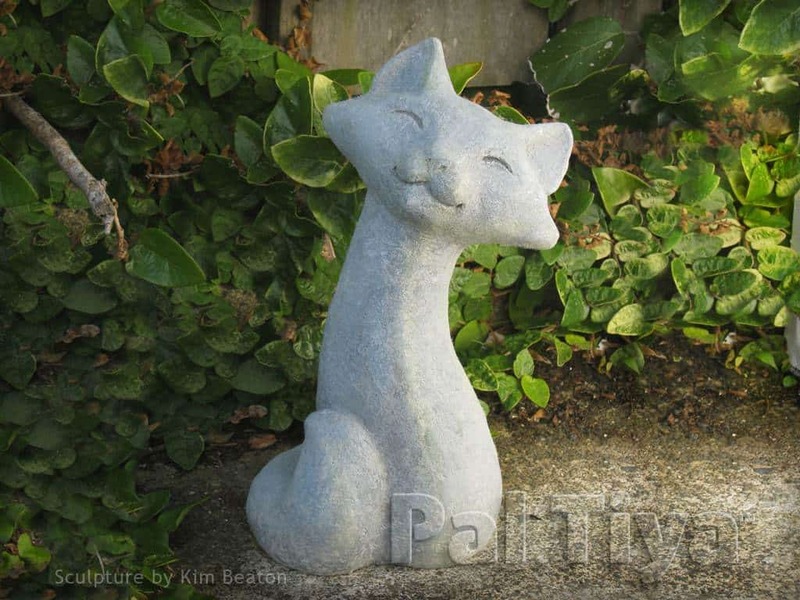 (Kim started as a paper mache sculptor, so I’ve been following her career for years.) 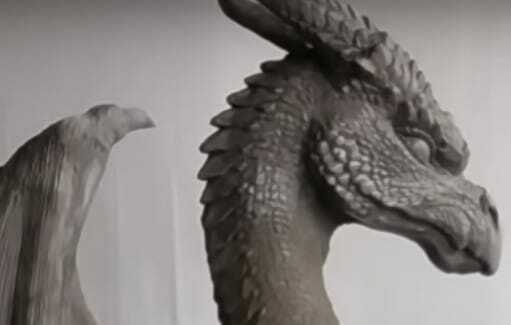 Until now, their new sculpting materials has only been available to the lucky folks who live in New Zealand, but now they’re trying to expand so people living in the US can play with it, too. 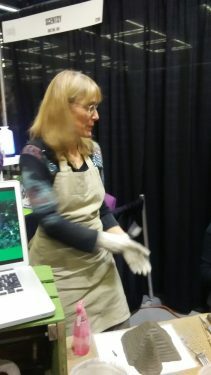 I just came from the Seattle Home and Garden Show this Thursday February 23rd. Kim Beaton came with some people to help promote Pal Tiya. They are trying to crowd fund, by trying to get lots of orders. If they do not get the funds in a timely manner, they will have to go to the UK. I was told there was a lot of interest over there. I would like to help them keep the project of the factory here in the US which is their preference and you were instrumental in getting a lot of people here interested in Pal Tiya including me. I bought the 8 pound bag. They will send the orders received when they have a lot of them and the will ship for $10.00. That is one heck of a deal since those bags are not light. But seeing Kim doing her magic was exciting. She is what she portrays in her videos, warm and really nice. My big excitement was seeing the dragon I’d seen on Youtube and it was huge and gorgeous. 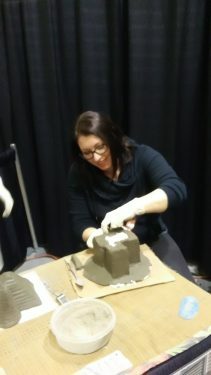 I told Kim about one of our readers who made a dragon out of paper mache who wants to make a sculpture of pal Tiya, and Jonni wanted her to make a video of her progress to show how a newbie used the product. I asked Kim if with her permission if we could use her video to show how everyday people could used the product. They showed how a ten year old made her Pal Tiya project. (See video at the bottom of this post). I got to play with a sample and now I am hooked. Could we use your platform to advertise to your members to order so that they could meet their crow funding goals? I know a lot of your members have shown a lot of interest in doing sculptures and the interest will give them incentive to open a factory in this country. We can help by using Facebook, word of mouth to get people to buy the 8 lb. bag to try it out and experiment; I ordered one and when it ships, I will be busy. Kim Beaton told me she has had a lot of people say they have no talent, that is not true she says. People who can mold and squeeze tin foil can create anything. All it takes is practice. Also the more videos we make of our Pal Tiya projects the more the product will be discovered by the artistic community. Children can make some nice projects. We can do this. For more how-to videos about using this material for outdoor, weatherproof sculptures, go to the Pal Tiya website. 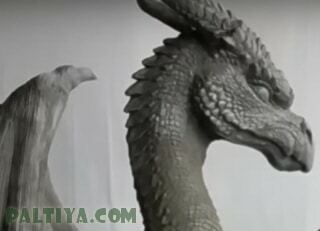 I first saw Pal Tiya on a behind-the-scenes tour at Weta Workshop (in Wellington) and have been eagerly awaiting it’s arrival in the US – for almost three years now! I’ve got my trial bag ordered, and can’t wait to get it. I’m looking forward to seeing Pal Tiya used and experienced throughout the world. I’m from the UK and it’s certainly getting interest here. Can’t wait to start sculpting with it! Imagine creating these epic creations in people s gardens etc! Wow, lol. Such a unique and cool material! The potential is great! I am so jealous that Christine got a chance to meet Kim and play with Pal Tiya. I have already ordered some….they expect it to be shipped in March, their original date was January so I do hope they get enough orders. I only ordered the small bag because like Christine, I wanted to test it out first. Christine, you do so have talent! I am glad you got a chance to go to the home and garden show. Seattle is a bit far from PA or I would have gone as well….and maybe met you too! Hi Jonni i dont know if you remember me. I’ve been a fan of yours for years. I did the cement yard art. I’ve also looked at Kim’s material before and would love to get some. I’m not sure how to order can you help me? Hi Julie. It’s good to hear from you – and yes, I remember you. There is an order form for the product on the Pal Tiya site. And they’re looking for teachers in the US to help people learn how to use the product, and you’d be a perfect candidate. On their home page, the ‘crowd funding’ box at the top goes to the order form. Hi everybody, I just wanted to tell you all that Kim and friends are trying to get professional videographers to make ads for this country to take the message to the media. The reason it is not available yet out of New Zealand is shipping to the US and other countries is hugely expensive. If they do not meet their goals here in the US they might be going to the UK for production and that will make it even more expensive now. The reason the bags are expensive is they brought just a few bags and not a whole lot of inventory for the obvious reasons. But lots of orders and the manufacturing here would bring down the price exponentially. By buying a small bag will give me a chance to experiment and prove to myself that I have some talent as unfortunately I have often told people I do not have talent. Now will be the time to prove me wrong. Viva la tin foil! Christine, I’ve seen your work, (and those wonderful photos) and I think you have talent, so I must disagree with you. The little critic inside our heads is always the worst. 🙂 And thanks for the additional info. Did they say that they have to ship all the stuff to us from New Zealand? Aren’t there local sources for their ingredients? We would be manufacturing in the USA if we manage to meet our targets!! Thanks, Yvonne! We’re all keeping our fingers crossed for you. I am sure they do, but I did not ask if they could or not. That will have to go to email with Kim to ask if they do. They want to have a factory. They brought I am sure enough supply to send but they did not want to be stuck with a huge inventory they will have to send back to New Zealand. So the more orders they have, the more they can fulfill in a timely manner. They will have to staff and train people to manufacture and that takes capital. I if I had a million I would help build that factory here as I am confident it will take off. It is such a neat product. This IS cool! This looks like a GREAT material. I checked out their whole website. I would love to help them out and work with this stuff but It’s a little pricey for me at $59.95+$10 shipping for a bag that will only make 2 bread loaf size sculptures! Jonni, are you trying it out? I wish them all the best and hope they get the business going. Maybe the price can come down later? Hi Julie. I”m holding off right now, because I spent so much money on art supplies last month. The bank account needs some time to rest and rejuvenate. I do hope they get their orders, though. I wonder if they’re also doing a Kickstarter campaign? This would be the perfect project for it. I am from Germany and I’m very interesting this material. Where can I get pal tiya in Germany? You might want to check the Pal Tiya website. This is their contact link. I think it’s currently only available in New Zealand, but they’re trying to expand. This is so cool! I ordered a big bag because I’ve been wanting to make some outdoor sculptures. Hopefully they make their goals. Thanks Joni for sharing this! You’re welcome. I’m so glad Christine volunteered to write this post, because I think it takes a lot of courage to start a new business in a completely different country. I can’t imagine how tired Kim and her husband must be, with all the work they’re doing to make this happen. Let us know what you think of the product (and show us what you make with it) as soon as it arrives.